The decision by the International Criminal Court to drop charges against Kenyan President Uhuru Kenyatta will likely invite a new chorus of criticism against the Court. But the truth is that the ICC’s case against Kenyatta was doomed as soon as he won a close election in March 2013. As head of state, he has been able to obstruct the investigation and prosecution quite effectively. Amidst the newest wave of disparaging assessments, what can we confidently say about the impact of the ICC? Many early evaluations in social science argued that the conflict situation in Uganda would be better today if the International Criminal Court (ICC) had not indicted members of the insurgent group, the Lord’s Resistance Army. Other authors made the contrary counterfactual argument that if the ICC had not intervened, the situation in Uganda would be more violent. In the case of Kenya, some argue that the situation would be better had the ICC never intervened; others might contend that although the ICC has now dropped the case, ICC involvement contributed to a significant decline in violence in the most recent election because Kenyan political leaders knew they were under the watchful eye of the court. 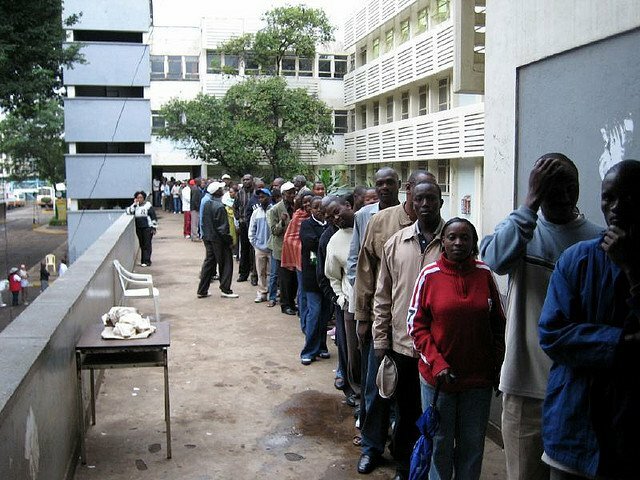 Kenyans wait to vote. Some argue that ICC involvement contributed to a significant decline in violence in the most recent election because Kenyan political leaders knew they were under the watchful eye of the court. We cannot resolve these counterfactuals to anyone’s satisfaction. Recently, however, cross-national empirical studies of human rights enforcement efforts have compared a number of cases on the actual impact of international criminal justice. Newer impact studies can be grouped into two different types: those that examine the effect of the ICC in ongoing conflicts and those that analyze the broader impact of the ICC on law and violence in the longer term. With regard to the involvement of the ICC in conflict zones, Beth Simmons and Allison Marston Danner found evidence that merely the ratification of the Rome Statute by a government tends to be correlated with a pause in civil war hostilities. Accepting the Court’s jurisdiction presents an opportunity for governments to make costly, credible commitments to peace. In a new working paper, Beth Simmons and Hyeran Jo find that, when comparing a number of conflict states, the threat of ICC jurisdiction has led to reduced violence against civilians. They argue that this effect is the result of both the increased likelihood that the Court will prosecute, but also what they call “social deterrence”, or the ability of the ICC to mobilize social pressures to deter crimes. According to the study, the ICC has a stronger positive effect on governments than on rebels. Yet, even the Lord’s Resistance Army in Uganda reduced its levels of violence against civilians after the beginning of the ICC’s investigation. In either case—ceasing hostilities or decreasing civilian targeting—the effect of the Court relies on civil society actors, which work in the shadow of ICC interventions to support accountability and monitoring. Our own research with the NSF/AHRC-supported Transitional Justice Research Collaborative (TJRC) has focused more intently on the legal and social impacts of the ICC and other efforts at criminal justice. In a paper recently presented to the American Society of International Law, Dancy and Montal show that the onset of official ICC investigations increases domestic prosecutions for low-level state agents that have committed human rights violations; countries under investigation have on average three times as many domestic prosecutions as other countries. The reason is that ICC investigations provide an opportunity for civil society actors to mobilize courts and demand reform under the eye of a global audience. When the judicial system is able to systematically issue guilty verdicts, repression lessens even more, perhaps because it signals that the rule of law is firmly in place in these countries. More of our work has examined the impact of these domestic human rights criminal prosecutions over time. Some of these prosecutions use international criminal law, but most continue to rely primarily on domestic criminal law. We show with quantitative statistics that a strong link exists between domestic human rights prosecutions and improved physical integrity rights. When the judicial system is able to systematically issue guilty verdicts, repression lessens even more, perhaps because it signals that the rule of law is more firmly in place in these countries. In essence, retributive justice against former state officials appears to work in the way it is intended: it is associated with improvements in the very human rights practices that were the focus of the prosecutions. But the research also suggests a number of important caveats and conditions. First, international criminal justice is cost effective when compared to massively expensive and often ineffectual campaigns to alter deep structural causes of human rights violations, including poverty, inequality, civil war and corruption. Second, international tribunals do not work by themselves, or in isolation. The effectiveness of international criminal justice depends on the continued domestic and transnational legal and political mobilization to continue pressure for accountability. Third, the impact of the ICC depends on its interaction with domestic governments and judicial institutions in transitional and war torn societies. As argued in The Justice Cascade: How Human Rights Prosecutions are Changing World Politics, what is emerging is not a new, independent and supranational system of courts. Rather, we see “a decentralized but interactive global system of accountability”, in which international tribunals and international criminal law interacts with domestic institutions and national and transnational civil society groups to help deter future crimes. At a recent conference on the impact of the ICC held at the Hague Institute for Global Justice, dozens of premier ICC scholars and practitioners disagreed over what contribution the Court has made to peace, restorative justice and domestic enforcement. Many argued that observers should temper demands being placed on the ICC, which is being expected to act far beyond its budget and its mandate. Crucially, however, not even the most skeptical analysts produced evidence that the net effect of Court interventions has been negative, nor did anyone call for the ICC’s abolition. The results of recent empirical studies lead us to support this cautious consensus about the positive benefits of international criminal justice. Research is beginning to show that human rights prosecutions are associated with improvement in core human rights over the intermediate term, and, at a minimum, do not exacerbate conflict or undermine democracy. From the point of view of a short-term policy option, these are quite positive findings—stronger, for example, than the findings on the impact of other tactics like economic sanctions, trade linkage or foreign military intervention on human rights performance. When future panic about an ICC “crisis” arises, this evidence is worth keeping in mind.